When your maiden name is Orr and you live in Indiana, it seems like maybe you’re destined to serve in a politicial office. 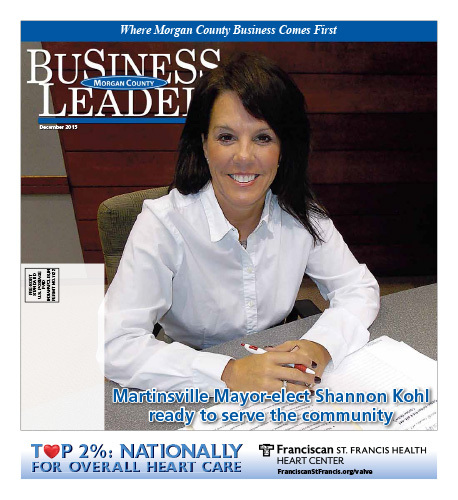 Although incoming Martinsville Mayor Shannon Kohl says she’s not closely related to former Indiana Governor Robert D. Orr, she does remember being captivated by the TV commericals the governor ran. From a young age, Kohl has always been interested in politics. She has been a Republican for as long as she can remember. Besides Governor Orr, another person who inspired Kohl’s interest in politics was President Ronald Regan. Kohl is also proud to be a Martinsville resident for 36 years. In 1978, her family moved to Martinsville where she attended Central Elementary School during second grade. the following school year, she transferred to Tabernacle Christian School, which she attended for the rest of her elementary and middle school years. During high school, Kohl attended Martinsville High School during her freshman and sophomore years and Tabernacle Christin School for her last two years. Following graduation, Kohl went to work at farm Bureau Insurance for two years. In 1989, she and her husband Brian, whom she met at Martinsville High School, were married. They briefly lived in Indianapolis, but in 1990, they decided to move back to Martinsville to raise their children. In 2000, she started selling real estate – first for Wayne Ready Realty and later for Keller Williams. During her years as a Realtor, Kohl also worked for the Martinsville School Corporation as a teacher’s aide and a manager in the high school book store. Additionally, she was very involved in the community, too. She was a court-appointed special advocate for children (CASA). She served on the board of Habitat for Humanity. She was a fitness instructor at the YMCA for five years. She also was a member of the MIBOR Realtor Association. And she was a member of the Methodist Church. Furthermore, her children were “active in everything,” which meant Kohl was also active in those same things. Around 2008, Kohl began her political career when she became a Republican Precinct Committeeman. But by 2012, she had decided she wanted to be more involved in Martinsville’s government. Kohl went on to win on the first ballot for the at-large seat on the City Council. Now at the end of her third year on the City Council, Kohl is proud of her many accomplishments. “What I am really proud of is being able to identify to the Council that we needed to do things differently with our finances. I’m proud I helped to get the budget back in shape,” she says. “Also I’m really gratified by the accomplishments of the boards I have served on. I’ve been a City Council representative for the Indiana Association of Towns and Cities. I’ve been really involved in the Morgan County Economic Development Corporation. Download the full December 2015 Edition here.